Several years ago, we (ADMS) put out this form in the registration booklets, it also appeared in the BRAYER magazine. We are trying to gather some data that will help us determine the average proportions of bone length and height in the Miniature Donkey. We hope that this research will give us a way to devise a way to determine Dwarfism in the Miniature with the use of measurements. As we have published in past issues of the BRAYER magazine, the most commonly seen traits of dwarfism are extremely short forelegs, long backs, and large heads. However, these traits may not be clearly defined in all animals. If we have an average curve, with an inside and outside limit, we might be able to better label animals suspected of having dwarf characteristics. 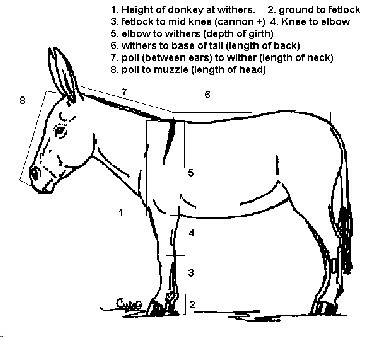 The information was used to gather a set of statistics on the average measurements of the head, body length, leg length of miniature donkeys, and how these measurements corresponded to one another. The goal of gathering this information was to compare the head-to leg, leg-to-height, and back-to-height ratios of miniature donkeys. Working with numbers gathered in the 1970's by Willoughby for his "Empire of Equus" book, it was possible to formulate the average numbers for horse types (he measured numerous horses of several breeds, and came out with averages for proportion) as compared to what we were seeing for Miniature Donkeys. If we could find an average (matched visually by photos and measurements) then we would also be able to see which animals (again, by photo ID and then verified by measurements) fell outside the average. If the animals outside the average in measurements also visually showed large heads and short legs, we would have some data to go on in isolating dwarfism. Owners sent us quite a bit of material to work from. We worked from the numbers gathered, and found the measurement we felt indicated immediate dwarf tendencies, the head to leg ratio, was between .75 (head to leg lenght of 1.0) and 8.5 to be in the "normal" range. The average ratio was .799, the head being 80% of a unit of 100, as compared to the length of the leg. at unit 100. Animals with a leg length of .95 or greater (up to 1.15) indicated dwarfism in visual reference. Willoughby indicated in his research that given a standard height unit of "100.0", the legs were 59.8, head 39.1 % of 100 in the Arabian horse, all the way to 57.2 leg length 42.4 (head length) (from the base 100) in the Draft Horse Converting these numbers into the same formula we used for donkeys, Arabian horses head: leg ratio was .653, Thoroughbred horses were .692, Shetland (British) ponies .755, Draft horses (Euro/Heavy) .741, Przewalski horse.791, Onager/Kulan .722, Standard Domestic Donkey .764, Grevy's zebra .798. Therefore we are seeing Miniature donkeys with larger heads than even a zebra or draft horse, when compared to their leg-length ratios. Continue to Next Page to see some side-by Side comparisons of Proportions in Equines.